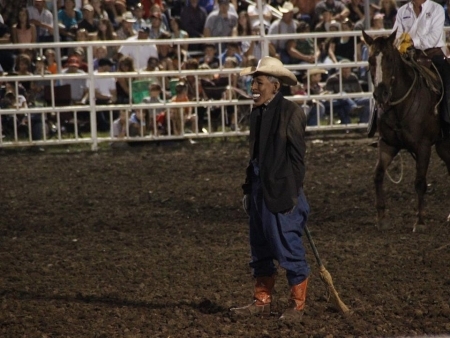 Obama-Mask-Wearing Clown Returns To The Rodeo! Liberals tried to destroy rodeo clown Tuffy Gessling for making fun of Obama. He was banned for life from the rodeo where he was working, the NAACP asked the Feds to investigate him, and there were even threats that his house would be burned down. …..All for making fun of Obama. Well, for the first time since the incident, Tuffy Gessling is working again. The rodeo clown at the center of last month’s state fair controversy was in Jefferson City Friday for his first performance since the fair. Tuffy Gessling told KRCG 13 he’s had a lot of cancellations since the fair, when he asked the crowd if they wanted to see the president get run down by a bull. The sketch ignited a national controversy with some groups, including the NAACP, accusing Gessling of racist intentions. The White House never took a position on the issue. Gessling was banned from performing at the state fair for life. At the Jefferson City Jaycees Fairgrounds Friday afternoon, Gessling appeared unconcerned about the upcoming rodeo. He said while making a Wal-Mart run into town earlier in the day, people came up to him and shook his hand. “Everybody was telling us how glad they were that we were here,” he said. Amped Up Pro Bull Riding owner Isaiah Dunn said he booked Gessling months before the state fair and never considered dropping him from the schedule. He said he saw the Obama sketch in person and saw nothing wrong with it. “It wasn’t anything that hasn’t been done all across the United States,” Dunn said. Congratulations to Isaiah Dunn for having the courage to do the right thing. Gessling did absolutely nothing wrong. His only sin was to be a powerless man making fun of a thin skinned President and the Left tried to destroy him because they could. It was immoral, it was wrong, and if liberals had a sense of humor or believed in the constitution, even they would have been standing up for him.